The venue for this year’s Christmas Meeting was Exeter Racecourse. We were all grateful we hadn’t had to brave the snow which we experienced at our last Christmas meeting in Hatherleigh. The racecourse is a great venue with plenty of easy parking and excellent facilities. Plenty of loos is a big bonus when 250 ladies attend as they did on Saturday 25th November! 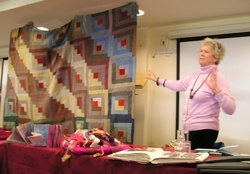 Our first speaker, Sue Spooner, treated us to, “A Look at a Quilter’s Life” and what an interesting and engrossing look it was. Sue is a farmer’s wife and has to fit her quilting around a busy life on the farm and her family life. One of her mottoes is ‘Waste not want not.’ Having been a war baby and not being a shopper, she very rarely buys fabric, preferring instead to recycle textiles, Her garage is a veritable cluttertorium of recycled fabric! 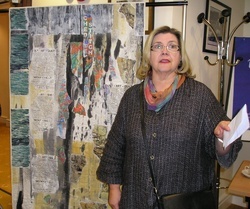 She spoke of the early influence of her grandmother and her beginnings in quilting. The Part 11 of her City and Guilds Course was a research project which she chose to base on Dartmoor. We were shown the scrapbook she compiled for this project in which the pages were all painted with peat before she included photographs, paintings and other objects from which she drew inspiration. Sue went on to talk of the many tutors and colleagues who had influenced and informed her work. Each stage was accompanied by a variety of pieces of work ably displayed by those hard-working members with the longest arms! Her interpretation of sail boats and her use of cutbacks to reveal beautiful jewel like colours was much admired. She left us with her Words of Wisdom – Say Yes to Life. A generous, warm and informative talk – thank you Sue. We next heard from Catherine Pickering, a third year student at Bath Spa University, who is studying Textiles and specialising this year in print designs. Catherine is the current recipient of a bursary from our Sunset Trust, the funds of which are accrued from the sale at meetings of second hand fabrics etc. She finds much of her inspiration in flowers and artists such as Miro and likes strong colours and lines. 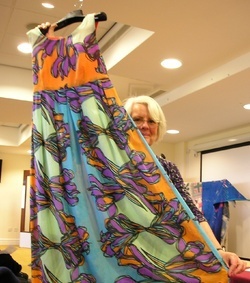 She showed three dresses, the fabric of which she had printed digitally with her own designs and then made up. She concentrates on floral designs and uses the Photoshop computer programme to alter them and make them different. Catherine is a young woman with ability, drive and ambition and we hope she fulfils her dreams. The Show and Tell saw several members sharing their latest creations and these were met with much interest and appreciation by the members. Thanks to all who took part. Once again the screens for the slides and the overhead plasma screens [now cured of their morning flicker] came into their own in helping us view the complexities of some of the pieces. Sandra originates from Canada but has been in England now for 35 years, longer than she lived in Canada. She attended art college in Toronto in the 60’s and made a career as a graphic artist in publishing. During the 1980’s she worked in London as an illustrator. 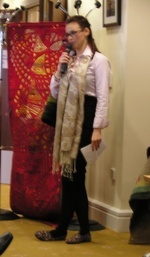 In the mid 90’s she moved into contemporary quilting and did a City & Guilds at Berkshire College. She has won awards at Malvern and Ascot and did a Diploma in Stitched Textiles, Her sketch books play a big part in her stitching inspiration as does photography. She encouraged members to do quick 30 second sketches of objects or paintings because the speed often captures the essence of the subject. We were lucky enough to see many examples of Sandra’s work including three dimensional pieces with wire stitched in for texture. A work called ‘Under the Arches’ consisting of sectional pieces of mounted material of views across the River Thames from the Tate Modern involved Sandra taking 80 pictures as the basis of the work. She uses a lot of photo image transfer work which she works up with a variety of techniques, materials and stitching. Her ‘outside the box’ thinking and execution certainly gives food for thought. She has written a series of books on various themes in her work and will be exhibiting at the Designers Guild in Bovey Tracey. Well worth a visit. Thank you Sandra.